Democrat David Green is touting his financial experience as an advantage in his race with Republican Michael Baumgartner for Spokane County treasurer. When Spokane County voters cast their ballots in the next week-and-a-half, one of the down-ballot races will be for county treasurer. The incumbent, Rob Chase, is leaving to run for county commissioner. The race involves two candidates who have fundamental differences about the role of the treasurer. On the campaign trail this summer, Michael Baumgartner is enjoying looking back at his eight years as a state senator from Spokane. "We have accomplished a lot of things, from doing the new WSU medical school to full funding for North-South Freeway to the only tuition cut in American history and it’s all been a team effort,” Baumgartner said. But Baumgartner says he’s ready to work closer to home. He has a wife and four children eight or younger at home and he sounds ready for a new professional opportunity. The challenge he has chosen is Spokane County treasurer. “If we are successful in that process, I’ll look forward to fighting tax increases and trying to manage the office well and try to bring people closer to their tax dollars with some transparency initiatives that I want to do. It’s just to continue on in the spirit of public service,” he said. That public service is to do the financial business of the county, which Baumgartner says he embraces. But he says the treasurer can have added value. “The treasurer can also be an important advocate for policy. I know personally because I’ve worked with them in the Senate,” he said. He says he worked with county treasurer Rob Chase and Chase’s deputy, Spokane Representative Mike Volz, two years ago on a bill that related to paying back taxes. Baumgartner’s Democratic opponent, David Green, has a fundamental disagreement with that view. 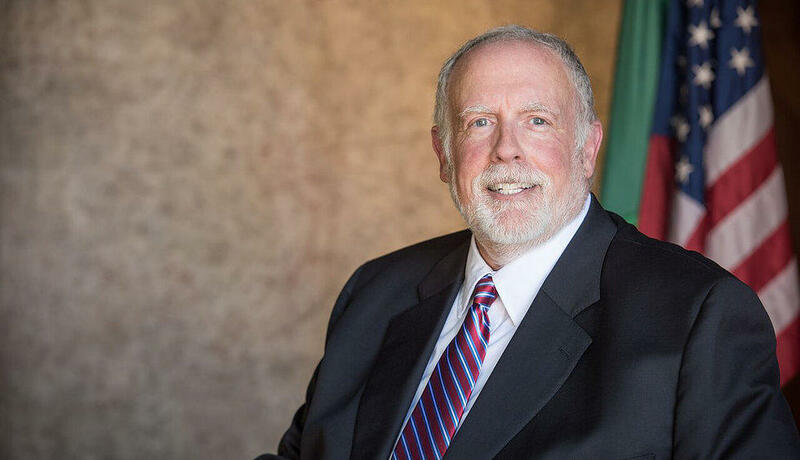 “I don’t think it’s appropriate for any single county treasurer to express his or her policy positions because treasurers in Washington state, county treasurers, should speak with one voice,” Green said. There’s another issue about which they disagree. What are the best qualifications for a treasurer? Green has been a certified public accountant for 35 years. To Green, the answer is obvious. Go with the person with the financial chops. “It’s a task-focused job. The 30 or 31 people in the treasurer’s office focus on collecting and keeping track of real estate taxes, collecting excise taxes when property is sold. They manage and keep track of funds for about 80 other governmental entities and I decided it was important to have competence in county government as opposed to someone with a policy background in this role,” he said. Baumgartner thinks Green’s view of the treasurer’s job is too narrow and says he has financial experience to go along with his policy background. “Academically, I studied economics at WSU, have a bachelor’s in economics and a minor in mathematics, then went to Mozambique and worked for the Jesuits for awhile as a volunteer and went to Harvard for my master’s degree. At Harvard, I taught economics and enjoyed that process,” Baumgartner said. And he points to his time as one of the leaders of the Senate Ways and Means Committee and his role in writing state budgets. So, says David Green, it’s left to the people to decide. “I think the voters of Spokane County should have a choice as to who their treasurer should be: someone who’s got 35 years plus of financial experience or someone who’s got little, if any, financial experience and has been historically focused on policy issues,” he said. We’ll have an idea about which they choose after the polls close on August 7. Since it’s a two-person race, that vote will merely be an advisory vote. The next treasurer will be elected in the November general election. Hear a longer version of Doug Nadvornick's story that appeared on Inland Journal.